"Lisa... fabulous! The garden looks so, so much better. Thank you very much. It's a pleasure to go out there again!" 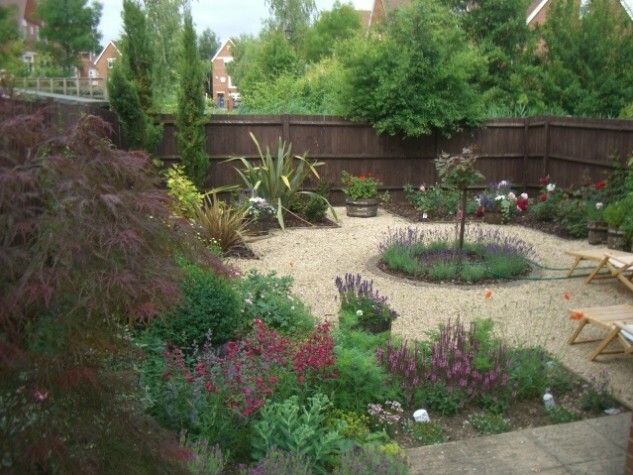 We were asked to rescue this garden owned by a very busy professional who wanted to enjoy his outside space but didn't have the time or the knowledge to plant and maintain it. After a whole season of neglect the weeds had taken over the paths and beds giving the space a desolate, unloved feeling. The owner had tried to tidy it up but the weeds kept coming back and phoned us out of desperation to rescue his garden. We started with a total clearance. Two of the beds were full of heavy clay soil so it involved a bit of back work. We then got our friendly assistant Bert to paint the fencing. We planted a rose garden in the back corner bed following a red, pink and white colour scheme, featuring hybrid tea and floribundas roses. A white rambling rose and a dark pink climbing rose were attached to the fence behind to create a cottage garden feel. The whole rose garden was then covered in weed matting and wood chips to suppress the weeds and to enhance the overall appearance. We planted several Parthenocissus henryana Chinese virginia creeper and a lovely Trachelospermum jasminoides Star jasmine along the side fences to create a full seasonal coverage. The centre bed was then planted with a deep red standard rose and a ring of Lavandula angustifolia Imperial gem around the edge. This was also covered with weed matting and bark. In the front right bed we built a raised herb garden, made from wooden sleepers. Here we planted some evergreen herbs such as Rosmarinus officinalis Rosemary and Laurus nobilis Bay and a lovely Salvia officinalis 'Purpurascens' Purple sage, leaving plenty of room for annuals to be added in the spring. We planted the herbaceous bed with flowering shrubs and perennials to add to the 'cottage garden' effect and to create more summer colour. We also bought in several wooded barrel planters, which were filled with winter colour cyclamens and tulip bulbs for an early spring show. A shed was built in the back so that all the garden tools can be stored away neatly.